My current research tries to formalize and model this type of dynamic form of organization-through-interactions, within a Piagetian dynamical sensorimotor framework and inspired by protocellular theoretical modelling. I am currently exploring the notion of a habit (understood as a self-sustaining pattern of sensorimotor correlations) as a potential building block of the organizaton of Mental Life. For doing so I have developed and evolutionary robotics model in which hebbian homeostatic plasticity is optimized in a robot both to solve a minimally (and non-trivial) cognitive task and to develop and sustain the stability of the controller through interactions. I am also working, together with Ezequiel Di Paolo on a review and re-appraisal of the notion of habit in the history of philosophy of mind and cognitive science. Barandiaran, X. (2008) Mental Life. A naturalized approach to the autonomy of cognitive agents (University of the Basque Country, Spain). Under the supervision of Alvaro Moreno. Barandiaran, X. & Moreno, A. (2006) On What Makes Certain Dynamical Systems Cognitive. A minimally cognitive organization program. Journal of Adaptive Behavior, 14(2): 171–185. Barandiaran, X. 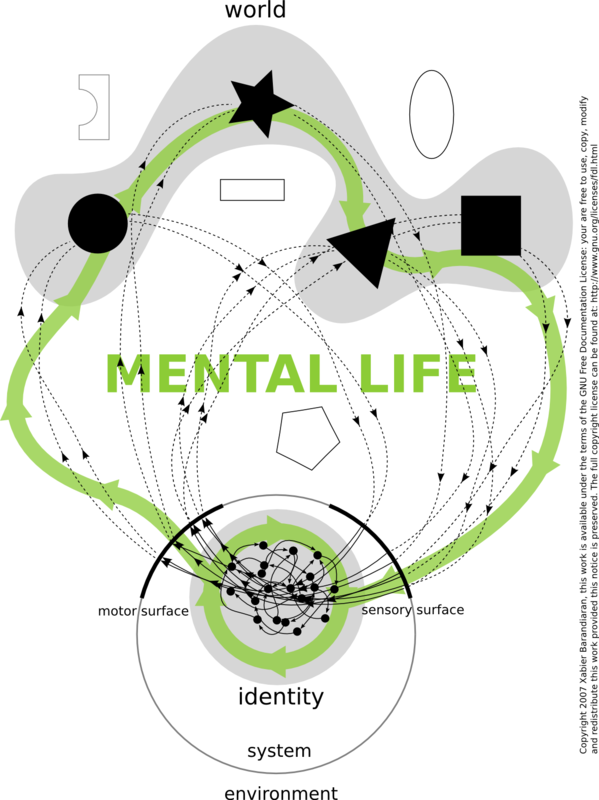 (2007) Mental Life: conceptual models and sythetic methodologies for a post-cognitivist psychology. In B. Wallace, A. Ross, T. Anderson, J. Davies. (Eds.) The World, the Mind and the Body: Psychology after cognitivism.. Imprint Academic, pp. 49-90. All rights reversed: freedom is granted to copy, modify and redistribute all the content of this site, provided that this notice is preserved, under the Creative Commons Attribution- Share Alike license. Unfortunately, I cannot grant the right for people to copy, modify and redistribute some of my papers. This is so because I prostitute my intellectual creativity to current (and degrading) academic standards that force me to deliver my publicly founded work to private corporations. Please do not respect copyright, pirate all my work, open and free access to knowledge is a human right and should be defended. Life and Mind Seminars Life and Mind Seminars at the University of Sussex, an open forum to explore the biological roots of mind.